In The Polarizers: Postwar Architects of Our Partisan Era, Sam Rosenfeld offers a historical account of how polarisation transformed from being a perceived cure to a poison in US politics, starting with the Presidential election of 1952. This is a thorough and detailed study that introduces readers to the myriad figures who contributed to the development of what Rosenfeld deems the ‘polarization without responsibility’ of our present times, finds Matthew C. Simpson. The Polarizers: Postwar Architects of Our Partisan Era. Sam Rosenfeld. University of Chicago Press. 2018. In September 1950, a committee of the American Political Science Association (APSA) published a report highly critical of political parties in the United States. Titled ‘Toward a More Responsible Two-Party System’, the report openly questioned the ability of the two major parties, Democratic and Republican, to manage post-war governance, and it predicted a fundamental crisis in US politics unless the parties could be reformed. The situation was so dire, in their view, that the authors directed their findings not to other scholars but to party leaders, office holders and ‘everyone interested in politics’ in the hope of bringing about ‘a fuller public appreciation of a basic weakness in the American two-party system’. And what was this weakness? The two parties were insufficiently polarised. Because nothing distinguished them from one another, they failed to give voters a real choice between governing agendas. Viewed from nearly 70 years on, the committee’s argument is hard to believe or even to understand. Today, the parties in Congress are so at odds that they often cannot carry out the basic functions of American government, such as passing budgets and confirming presidential appointees. During election campaigns, candidates talk about their opponents as if they were members of a malevolent and alien species. This partisanship among elected officials is increasingly mirrored in the electorate. According to a recent study by the Pew Research Center, 49 per cent of Republicans and 55 per cent of Democrats say that the other party makes them ‘feel afraid’. And for the first time since Pew began collecting data, a majority in both parties expresses a ‘very unfavorable’ view of the other. 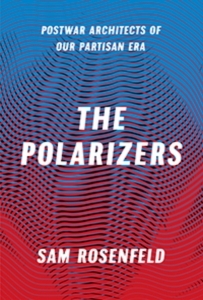 New book The Polarizers: Postwar Architects of our Partisan Era, by American political scientist Sam Rosenfeld, tells the story, or part of the story, of how polarisation transformed from a cure to a poison in US politics. Rosenfeld begins his narrative with the election of 1952, when Democrats lost control of the presidency and both houses of Congress. What is hard to grasp about mid-century American election campaigns is that the political parties of the time were nonideological. For example, the most outspoken civil rights leaders as well as the most strident segregationists were members of the Democratic Party. Similarly, liberal Republicans were to the left of conservative Democrats on issues such as women’s rights and environmental protection. From the APSA’s perspective, the problem with the post-war party system was that voters had no clear choice between policy platforms because both parties made room for conservative and liberal views. From the Democrat’s perspective, however, the problem was that there seemed to be no ready way to win back the presidency and Congress when nothing distinguished them from Republicans. Butler’s vision gradually won out and, perhaps as a consequence, the liberal side of the Democratic Party increasingly dominated national politics in the late 1950s and 1960s. Republicans needed a response to the Democratic surge, yet many of their leaders shared Johnson’s concern about the ‘politics of principle’. As late as 1959, former Republican congressman Robert Goodwin made the argument that ‘it is neither possible nor desirable for a major political party to be guided by principles’. He continued: ‘It is a good thing for the nation as a whole that neither of our two major parties stands for anything in particular.’ Yet by the 1964 presidential contest between Johnson and Barry Goldwater, ideology was coming to define both major parties. Rosenfeld introduces the reader, year by year, to the Democratic and Republican leaders who planned and deployed the modern ‘politics of principle’ up through to the election of 2016. Much of the pleasure of the book is in becoming acquainted or reacquainted with figures such as the left-wing intellectual Michael Harrington and Tennessee Republican Bill Brock who, along with more famous characters like House speakers Tip O’Neill and Newt Gingrich, shaped the politics of ideological polarisation. A possible criticism of Rosenfeld’s book is that he treats polarisation as the creation of a few political elites without saying much about the economic and social conditions that made ideological politics possible and effective, such as increasing immigration, the legacy of Jim Crow, media bubbles, self-segregation and a stalled standard of living. In any case, by the latter chapters of Rosenfeld’s story, the dream articulated in ‘Toward a More Responsible Two-Party System’ has largely come true. After the year 2000 or so, when candidates told you their position on any issue, you not only knew what party they belonged to, you also knew where they stood on every other issue. And when in power, parties would regularly violate procedural norms and traditions in order to turn their platform into law. Early-twenty-first-century political parties were perhaps the most ‘responsible’ in American history. So why is US politics such a mess today? The answer, in part, is that the critics of the ‘politics of principle’ had a good argument. The US constitutional system has an exorbitant number of veto points, or places where individuals and minority groups can derail the policy preferences of the majority. Even very popular measures can be stopped by a presidential veto, a Senate filibuster, a Supreme Court ruling, uncooperative state or local governments, among others. The elaborate system of checks and balances and the separation of powers demand a political culture of moderation, compromise and cooperation. In a politics organised around ideology, however, the opposition can come to seem not just mistaken but evil, and cooperation can be judged as collusion. Writing on this topic in 1960, the sociologist Daniel Bell noted: ‘The tendency to convert concrete issues into ideological problems, to invest them with moral color and high emotional charge, is to invite conflicts that can only damage society.’ In the extreme case, which in fact exists today, defeating the enemy becomes more important than advancing one’s own agenda. The perverse effect of injecting ideology into US party politics has been that achieving an ideologically coherent policy outcome no longer matters as long as the other party appears to have lost the latest battle. Rosenfeld calls this newest form of the party system ‘polarization without responsibility’. In 2013, the APSA published a new report urging American political actors to be less rather than more polarised. We can only hope that its dream also comes true.